Something I’ve been paying closer attention to in recent days are color palettes, lighting and sound design. It is easy to overlook these things. I recently watched Zack Snyder’s 300, which still holds up rather well, and Man of Steel, which I’ve been a fan of since its release. Both films highlight Snyder’s knack for the visual flair of filmmaking, though his reputation has taken a major hit of late with train wrecks Batman v Superman: Dawn of Justice and Justice League. His use of color palettes in 300 is especially noticeable. These elements should be recognized and appreciated because they usually play a strong role in establishing tone and texture. Such traits tell a lot about the atmospherics of a story as well as where that story is likely to go. 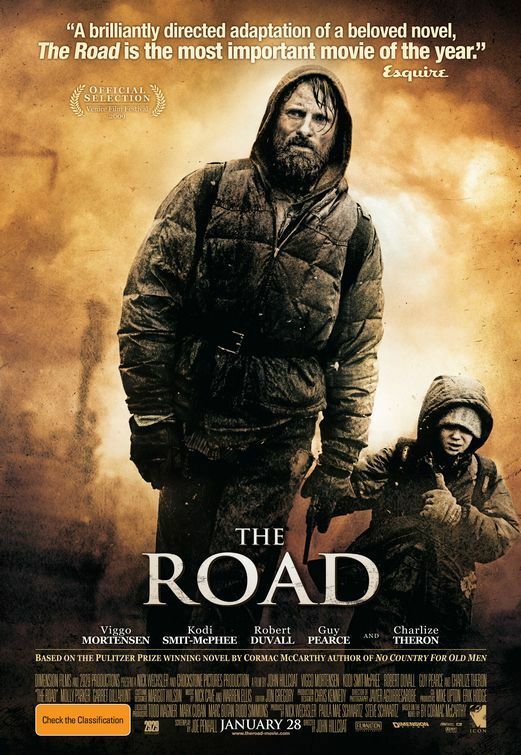 This brings us to 2009’s The Road, a film adaptation of the Pulitizer-prize winning novel of the same name by Cormac McCarthy. If you haven’t read the novel, you really should. It’s classic literature. Sidenote: I plan to do The Road for my next installment of Book vs. Film, so look for that in a month or two when I finish rereading the work that predicated this. Some of the film was shot in my hometown of Pittsburgh on the turnpike outside of the city and along Presque Isle beach, an old stomping ground of my childhood. Viggo Mortensen, a near perfect cast for our man, stars our central character. If you haven’t read any interviews with charming Viggo, you really should. He’s standoffish and avoids the spotlight at all costs, the polar opposite of what you would expect of someone who’s made a life in front of a camera. His seclusion is rather noticeable but his dedication to his craft is still highly regarded. Any true diehard Lord of the Rings fanatic is well-known to how immersed Viggo got in his role of Aragorn. Someone who takes method acting with the utmost seriousness will always have my respect in some form and Viggo certainly has earned mine. He feels right for this role, just on paper. Anyway, The Road is a post-apocalyptic tale about a father and son going through a starved planet while fighting for survival themselves, all while the man tries to both teach the boy the deepest meanings of life itself and the tactics and tools he needs to survive once his old man is gone. It is a very barren concept and it takes the hands of a true craftsmen to make a tale so sordid and uninviting feel so contagious to a reader and listener. To put things on the table, the boy in this tale, to those who are not picking up the least subtle of subtle hints, is a metaphor for childhood innocence. In the novel, McCarthy does not give his characters names, instead referring to them simply as “the man” and “the boy”. The boy’s youthfulness and ignorance to not only his current predicament but to the nature of human beings is especially precarious for the man, who is fighting inner demons, the harsh physical burden and dragging along literally the only reason he can chalk up to worth living for. In this scenario, we are literally watching a man carry a boy, his own dark thoughts, his doubt, his environment, his hunger, his heartache…dude’s carrying the world on his shoulders right now and for what? If it wasn’t such great writing, the book would be called Masochism: A Story of Hating Yourself (Think I’m gonna use that title for my autobiography). This type of emotional desolation brings a reprieve of intellectual fulfillment, wringing lines of true dialogue gold in McCarthy’s penmanship. Sadly, those nuggets got lost in the gold rush of this film’s production. While a modicum of valuable utterances may appear during its near two-hour run time, the picture lacks the same cognitive prowess of its original maker. John Hillcoat may have directed Lawless, a western/gangster ode I really need to revisit sooner rather than later, but that came after this direction. He’s out of his league here and it’s all too easy to see before you look at the finer details of the film. It’s clear he put a high priority on the three things I mentioned at the beginning of this review: color palettes, lighting and sound design (the film actually got critical praise for its cinematography). It’s a film with a continuous overcast that’s begging to be cast in black and white, though Hillcoat never goes all the way there, instead using a paintboard of different shades of grey to compound the seeming meaninglessness of our characters’ actions and inactions. It is more a dire canvas than a traverse through the bare bones of human companionship. It’s a work that characterizes its setting with disturbing normalcy and a lack of apathy, the mindset one would expect when such horror is so repeatedly seen. It is certainly visually competent. The Road is not about the road itself though, the road to freedom or some secret clearing where the world hasn’t keeled over. The Road is about the people who transgressed the path, about the humanity or lack thereof illustrated in its pages and in its steps. It’s about the tragedy that humankind has seen fall upon it, the diminution of their resolve and the endless slaughter of the concept of hope. This is a dissection of the human brain and heart as much as it is an autopsy of the psyche of an animal pushed to the brink of extinction. These are bricks of substance we’re talking about here. These are the types of discussion, the styles of theme you would expect in an adaptation of McCarthy’s work, but you will find yourself thoroughly starved by the end of it. The backbone of this film, the meaty morsels shall we call them, simply are not there. Again, the presentation is well-done and I give the crew credit, but the foreground, the thing we came to see, is nearly transparent. It is not because the background is that enticing. It is embracing but not to the point that this deserved an Academy Award nomination or the most strident rally. No, the writing desk simply shortchanged us. The same depths that I hoped to see on-screen are simply not approached with the most ardent of efforts. Imagine being a photographer and having a career-defining image laid in front of you. You take the picture and capture a large part of the glory in the back half, showcasing the texture I mentioned at the beginning, but in the pursuit of that panorama, that snow globe effect, of being seized by this little pocket of nature, you forgot about the central subject in your photo. What you captured is out of focus. That feels like the most appropriate metaphor for this viewing experience. It’s a product that delivers on one of its founding principles, visual storytelling, but dramatically fails in shipping the essential contents of the story alongside it. My score for The Road: 62. When it comes to the genre of post-apocalyptic dramas, you could do worse than The Road but you could also do much, much better. Viggo keeps this boat afloat, dedicating a capable effort to the cause whilst brief appearances from Charlize Theron and Robert Duvall feel like yet another headwind Viggo has to plow his way through. By the end of it, Viggo looks like a man beaten to a pulp physically but with plenty of emotional and cerebral punch left in him if only he was given the material to work with. I can’t help feeling like Viggo was waiting for the art to come and I couldn’t help feeling the same way. While not eligible for this series, Jamaal Charles was one of the best running backs in the NFL during the early 2010’s. Behind a stout defense, Jamaal Charles was essentially a one-man offense while Kansas City went through a carousel of quarterbacks ranging from Matt Cassel to Kyle Orton to Brady Quinn. The team also struggled at the receiving position during that time frame. Charles was it, which sadly meant a heavier workload that no doubt led to his injuries. I’ve always been a fan of long-tenured players and Charles was a mainstay in Kansas City for nine seasons. The ninth running back taken in a strong running back class in 2008 (Darren McFadden, Jonathan Stewart, Felix Jones, Rashard Mendenhall, Chris Johnson, Matt Forte, Ray Rice, Kevin Smith), Charles became a four-time Pro Bowler in Kansas City and currently owns the league record for yards per carry at 5.4. I can respect a Charles jersey. Linebacker Derrick Johnson, the man in the middle of those trench wars on defense, was a key contributor to the unit that kept the Chiefs from falling into complete obscurity and irrelevance. Another franchise staple, Johnson spent 12 seasons with Kansas City, earning four trips to Hawaii himself and amassing nearly 1,100 tackles. Recently departed Marcus Peters won Defensive Rookie of the Year in 2015 and since entering the league, has led the NFL in interceptions. He’s one of the game’s most prominent young corners and will look to add to that legacy in Los Angeles alongside perennial Pro Bowler Aqib Talib. I’m sure some will ask why Tyreek Hill wasn’t near the top of this list. He certainly meets the definition of playmaker and Kansas City showed he could be a regular contributor on offense in 2017 as they moved him to the top receiver spot. Hill is still a raw talent when it comes to his route tree and release but his speed is unmatched. He’s an energizing player to watch in that sense because he can dominate opponents in a way football fans are not used to seeing. Usually, players are outmatched because of a player’s perfection of their craft (see Brady). There are also times though where an athlete is leaps and bounds ahead of their peers and is manipulating them physically (see my comments on Antonio Gates in my last chapter). It’s hard to be on the same playing field when your opponent has reached an athletic bar you simply can’t ascend to. Hill’s speed is one of those bars that few players attain. If Hill is molded by his coaches and graduates to another level when it comes to the fine details of his position, such as his route tree, release, situational awareness and play recognition, he could become an elite receiver. Until then, he’s on the edge of brilliance but carries with him a lethal combination of big-play ability and momentum shift prowess. As for a jersey consideration, the reason he fell to the fifth round was because he punched his pregnant girlfriend in the belly and proceeded to put her in a chokehold. That’s just not someone I’m gonna support. This country, in 2018, still has a significant domestic violence problem and while I always hope those who fall into that hole become better people, it’s not a name I’m gonna wear on my back and parade around. Speaking of better people, Eric Berry is an inspiration not just to the gridiron faithful but to those who’ve battled and continue to battle cancer. Just like James Conner battled at the University of Pittsburgh and became the best-selling jersey in the NFL during his rookie year with the Steelers, Eric Berry is someone you can fight alongside. Berry has had three seasons cut short due to injury (torn ACL, cancer diagnosis, Achilles tear) but made the Pro Bowl in all five of his complete seasons. Travis Kelce was taken in the third round in a strong tight end class (Tyler Eifert, Zach Ertz, Jordan Reed). In the same way that the Chiefs never had an offense outside of Charles during his early years, KC never had a legitimate receiving threat until Kelce arrived. In 2014, his first full season, he was surrounded by Dwayne Bowe, Donnie Avery, Albert Wilson and Jason Avant. Jeremy Maclin and draft pick Chris Conley came the following season but defenses knew who the number one target was. This gave Kelce more targets and no doubt turned him into the elite tight end we know today. He’s made three Pro Bowls and has had over 80 receptions and 1,000 yards receiving in his last two expeditions. He’s right up there with Gronk and Greg Olsen. Alex Smith, the leader of this tribe, had a strong 2017 to finish his career in Kansas City, compiling career highs in passing yards (4,042), touchdowns (26) and passer rating (104.7). For many years, it looked like Alex Smith, a first overall pick in 2005, was going to be a draft bust. In the toxic and ever-changing environment of San Francisco, Smith saw a new coordinator on a yearly basis and struggled to stay afloat as other quarterbacks, such as Aaron Rodgers in that same draft, put up historic production. After five seasons of bottom-of-the-league efficiency, Smith fell in sync with coach Jim Harbaugh and put together two playoff runs, helping his team to a Super Bowl appearance. After the emergence of Colin Kaepernick, Smith was traded to Kansas City where he has spent the last five seasons. While not eligible for this series, I could understand why a sports fan could get behind a redemption story like Smith: someone who was viewed as a franchise savior, was slaughtered by mismanagement and opposing defenses ruthlessly for years but stuck with it, showed promise, and finally became the quarterback he was expected to be. For me, Smith has always been a game manager, and I mean in that in the most complimentary way possible. He’s played safe with the ball, made logical decisions and won games by playing games like chess. That is not the most entertaining way to play quarterback. He’s not an exemplary athlete who can do things like Rodgers nor is he a master strategist like Brady or a stat-piling monster like Brees. He’s never been an elite quarterback and has never been a player who can put his team over the top by himself. He’ll have the chance to prove me wrong in Washington, who doesn’t have a great supporting cast and hasn’t found a consistent starter at running back since they let Alfred Morris walk, but for me, a quarterback that will live on in the history of professional football is one that could carry teams and Alex Smith is not in that category. Kareem Hunt and one of the most impressive running back classes in recent memory (Fournette, McCaffrey, Cook, Mixon, Kamara) lit up NFL highlight reels. Justin Houston had a 22-sack scorched earth campaign in 2014. Since coming out of Georgia in 2011, Houston has become one of the league’s most-feared pass rushers. In his first four seasons, including that 22 monstrosity, Houston registered 48.5 sacks. Since signing his contract, Houston has struggled with injuries but we know what the man can do when healthy. My pick: Eric Berry. My jersey: Home Red. All three have aged well and Rivers has been no different. Over his 14-year NFL career, Rivers, along with Eli and Ben, has thrown for over 50,000 yards and 300 touchdowns, putting all three in the top ten of each category. All three have the chance to be Hall of Famers but there’s a notable difference between them: Ben Roethlisberger and Eli Manning have each won two Super Bowls. Philip Rivers hasn’t been to one. That monkey has been on Rivers’ back for a long time and will be for the rest of his life. That’s what happens when you’re drafted alongside talented stars that also play your position. You will always be compared to them, no matter how unfair it is that you are judged by someone else’s merits rather than your own. Roethlisberger is a probable HOFer for moments like the final drive in Super Bowl 43 or the back-to-back games he threw six touchdown passes or the multiple playoff wins he has. Eli is a possible HOFer for moments like the Tyree helmet catch that dethroned the undefeated Patriots. Rivers is unlikely to get into Canton because he doesn’t have that moment. That’s not to say the guy isn’t a good player. He’s breached 4,000 yards nine times in his career and owns nearly every Charger passing record. But it’s also difficult to overlook the 2006 season, when the then San Diego Chargers went 14-2 with Hall of Fame running back LaDainian Tomlinson in the backfield and couldn’t win even one playoff game with home-field advantage. Also, Tomlinson won MVP and Offensive Player of the Year during that run, just as a friendly reminder. It’s hard to overlook the Chargers falling short in the AFC Championship the following year to New England, although I do give Rivers a ton of credit (Rivers played the game with a torn ACL). In the 2008 season, Rivers led the Bolts to their third consecutive AFC West title before dropping yet another contest in the divisional round, this time to the Steelers. In 2009, after a 13-3 campaign, Rivers and San Diego left defeated in their first playoff game again, this time to the Mark Sanchez-led Jets. Rivers has spent six of the last seven years on the couch come playoff time and don’t worry, the one game he did get to, he lost. Look, I have nothing against Rivers. He’s a talented quarterback and still one of the better ones in the NFL. The Chargers haven’t made it to the playoffs solely because of Rivers. There are plenty of other factors at play. The fact remains: 4-5 in the playoffs. Zero AFC Championship wins. That just doesn’t scream Hall of Fame. Is there a chance he gets in? Sure. He’s still been one of the most prolific passers of his generation, but he’s not Ben, Brady, Brees, Peyton, Rodgers or even Eli. He’s just not a good bet. He’s still fun to watch. He’s still a gunslinger. He’s still elite. He’s just not tier one, top-of-the-game elite. Neither is his number one receiver, Keenan Allen. After a strong rookie season (Fun fact: At the time, only five receivers in NFL history had more receiving yards their rookie year than Allen’s 1,046), Allen suffered a broken collarbone, lacerated kidney and torn ACL in back-to-back-to-back years. He performed great this past campaign, winning Comeback Player of the Year. He’s a constant target for Rivers who will pad his stat sheet with receptions (one of five players with over 100 catches last year), run a full route tree (His 13.7 ypc was in the upper third for receivers) and has the vision to make plays in the open field (His 458 yards after catch ranked him fifth among wideouts). Remove this past year and the game to game consistency that you look for number one receivers to produce isn’t there. He’s a capable route runner but ran a 4.7 at the combine. He was recovering from a knee sprain that year and admitted he wasn’t 100% for Indy, but ran a 4.56 dash his senior year of high school, which isn’t out of this world speed for a receiver. While he’s 6’2″ and can make vertical plays, he doesn’t play an aggressive style like Demaryius or, more appropriately, like DeAndre Hopkins does. He prefers to out-finesse defenders than out-muscle them. He’s got the cut ability to do that. He is athletic enough to torture defenses who don’t have either agile corners or experienced defenders (12 recs vs BUF, 11 vs DAL, 10 vs CLE). When he has to play top-end corners, such as Aqib Talib in division-foe Denver, he struggles to take over games the way we are used to seeing top end flights do. In two games against Denver this season, Allen compiled 5 catches for 35 yards and 3 for 41. There are a lot of other factors at play. Unfortunately, I don’t have the time or funding needed to go over additional game tape and count his matchups against man versus zone and do even more stat-crunching than I’ve already done. You also have to consider the team’s game plan that week and the in-game situation at that moment. Overall, Allen is a great receiver in fantasy football. He’s a reliable option for an experienced and still physically-gifted quarterback and is in a scheme that allows him a high volume of targets. For that reason alone, he can be counted on for five receptions a game and a solid yards after catch bonus on a week-to-week basis. As a receiver, Allen is an above average talent that has never seen his potential fully nurtured due to injury and it’s prevented him from joining the ranks of AB, Julio, Green and Odell. Melvin Gordon, the stud from Wisconsin, still has the breakout speed that commands respect. Even now, defenses are still trying to force him to the inside and still he is able to make it work. You saw it in college, you saw it in 2016 and you saw it this past schedule. He hasn’t peaked yet though and I want to see what the next stage of his progression looks like before I buy in, which leaves me to discuss the player I just can’t pass up. Antonio Gates is one of the best tight ends in NFL history and when you consider he never played a down of college football, well, that just speaks to the amount of athleticism this guy has. Imagine being so physically gifted that you could pick up something at the last possible second and be better than people who had been doing that thing for their whole lives. Everyone around you has spent countless hours perfecting their craft and you’ve made them look like boys among a behemoth who just learned the rules of the game. That’s frightening. When you say the phrase “red zone threat,” I think Antonio Gates. Dude is too big and too strong. You could make the argument he was the one that started bringing basketball stars to the game of football. He’s one of only ten players in NFL history to amass 100 touchdown catches and he’s currently 30th in receiving yards. Melvin Ingram is a solid edge rusher. Joey Bosa is a technically-refined player that has some more hurdles to go through. Jason Verrett is a capable corner. Antonio Gates? He’s a freak and worth my jersey spot for the Chargers. My pick: Antonio Gates. My jersey: Home Blue.